Huckleberries are sometimes called “the fall blueberry” because they ripen after most other berries are gone and last on bushes for weeks. Several years ago I decided I needed access to huckleberries without driving all the way to a friend’s cabin to pick them. I naively ordered 12 small bushes from my favorite native plant nursery and scattered them all over my yard, in my flowerbeds and garden. Now they are taller than I am and covered with thousands (yes, thousands) of dark blue huckleberries. After I found a picking tool (a bear-like paw with a handle) to gather the tiny fruit, I was set. 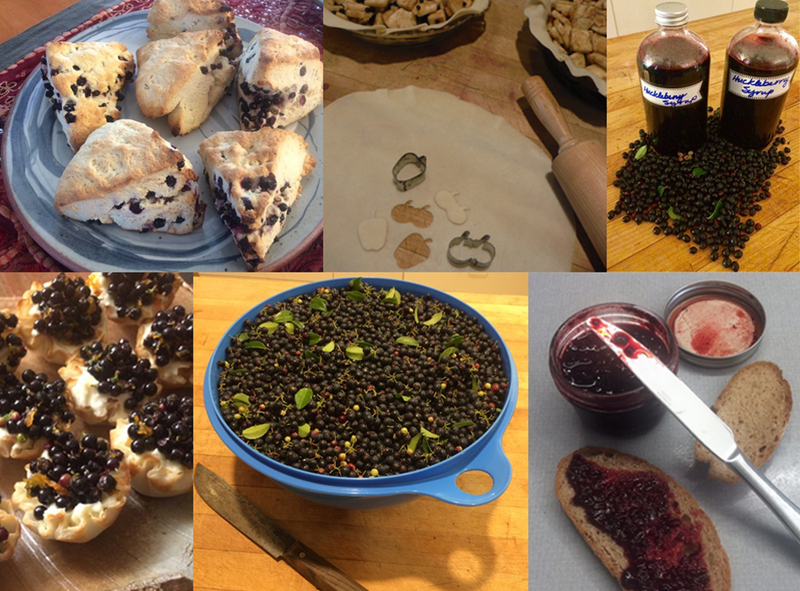 This year was a record huckleberry harvest: 28 cups of beautiful berries. Now I just need to figure out how to use up that much fruit. Thankfully, huckleberries freeze really well. Native to the Pacific Northwest, evergreen huckleberries are sometimes called “the fall blueberry” because they ripen after most other berries are gone and last on bushes for weeks. Huckleberries are associated with lowering cholesterol and protecting against heart disease. High in vitamin C and potassium, they protect the body against immune deficiencies and promote a healthy metabolism. If you don’t have huckleberry bushes, you can substitute blueberries in recipes. You can also find frozen huckleberries online and in specialty store freezers. Native huckleberries are tarter, brighter and more flavorful than store-bought blueberries. They also have more seeds, so if you make jam or a pie, mash and sieve about half the fruit. Apple huckleberry pie. Throw a cup of berries into any apple dessert, crisp or pie, and they will brighten the taste and color. Huckleberry mascarpone tartlets. One of my favorites: tart and pretty. Huckleberry scones. Use any scone recipe; omit the salt and fold berries into the dough right before baking. Huckleberry pancakes. Sprinkle on pancakes after batter is in frying pan. Huckleberry syrup. A batch lasts all winter and it adds a taste of fall to pancakes or waffles. It also makes a nice addition to salad dressings. Huckleberry ice cream. Be sure to mash and sieve the fruit—it makes the ice cream a beautiful color. Huckleberry jelly. Sieve at least half the fruit; I puree it in my food processor. Crust: use premade small tartlet shells from grocery store (most are low in sodium) or make your own favorite pie crust. If making your own, leave out the salt and add ½ teaspoon vanilla and ¼ cup ground walnuts or hazelnuts. Bake premade tartlets or use a muffin pan for homemade tartlets, pressing dough about a third of the way up the sides of cups. Follow baking directions on tartlet package or your own pastry recipe. Let tartlets cool after baking. Cream 2 tablespoons sugar, mascarpone and orange juice or Cointreau. Fill tartlet shells ½ to ¾ full. In a saucepan, add 1/3 cup sugar, 2 tablespoons orange juice, orange zest and cornstarch. Cook 2-3 minutes until sugar dissolves and cornstarch thickens. Remove from heat and add huckleberries. Stir and then spoon on top of filling. Chill and serve the same day. Makes 12 tartlets. Process berries in a food processor or crush with a potato masher. Separate all the juice and put pulp in medium saucepan. Add ¼ cup of water. Bring berries to a boil, and then reduce heat and simmer about 5 minutes. Pour mixture through a sieve, catching the berry liquid in a bowl or large Pyrex cup. Measure juice and return to saucepan. For every ½ cup of juice, add ½ cup sugar. Bring to a boil, stirring. Reduce heat and simmer until syrup thickens, about 5 minutes. This syrup will keep about 2-3 weeks in the refrigerator. If you have a large amount, you can freeze or can it. Serve with waffles or pancakes, pour over yogurt or ice cream, mix into homemade salad dressings or use for a sherbet base.